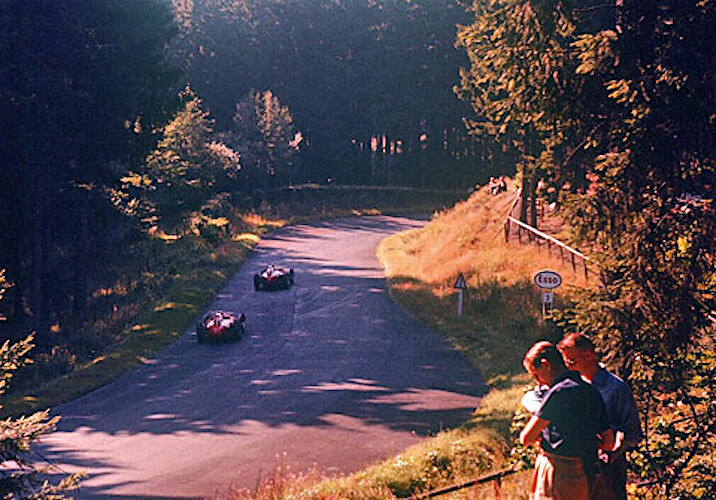 Regarded by many as one of the greatest Formula One races of all time and Fangio's finest drive, this is the 1957 German Grand Prix at the mighty Nürburgring Nordschleife. Juan Manuel Fangio was forty-six years old and a four-time World Driving Champion when he arrived at the Nürburgring in August for the 1957 Grosser Preis von Deutschland. He had already won the season opening race in Argentine, Monaco and the French Grand Prix. During practice on the 14.167 mile Nordschliefe circuit, the Maserati team determined that the Pirelli tries had too high a wear rate to last the 22 laps (311.674 miles) of the Grand Prix. Team manager, Nello Ugolini, and chief mechanic, Guerino Bertocchi, proposed a strategy where Fangio would start with a light fuel load and then pit at the half-way point to refuel and change rear tires. The mechanics thought they could add fuel and change the rear tires in thirty seconds. They also thought this would be easier on the rough Nürburgring track than running a heavier car. The Ferrari team would run a traditional non-stop race. The Vanwalls had performed well on the smooth surface at Aintree, but on the bumps, humps and jumps of the Nürburgring they were off the pace. 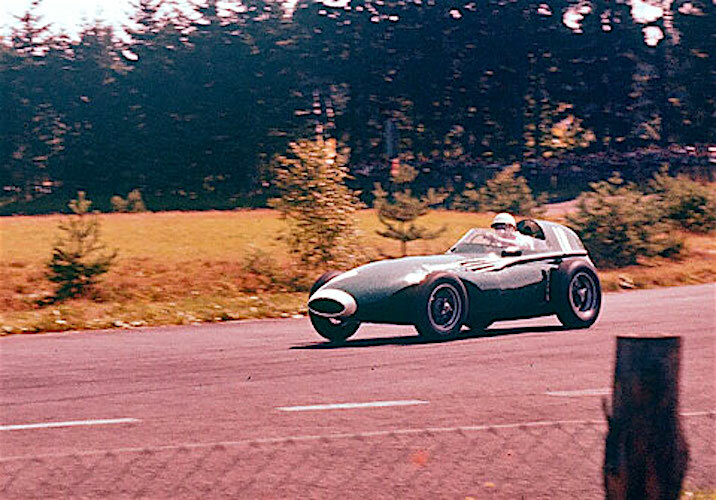 Stirling Moss has been quoted as saying, “The Vanwall’s taut suspension was totally unsuitable for the Nürburgring”. The track had been partially resurfaced since the previous year and practice times dropped considerably. Fangio would start from the pole with a time of 9min 25.6sec. Race day, August 4th, was hot, dry and sunny. At the start the Ferraris of Mike Hawthorn and Peter Collins took the lead. Fangio started out cautiously and it wasn’t until the third lap that he passed the two Ferraris. His third lap was a new record as were his fifth, sixth, eighth and tenth. 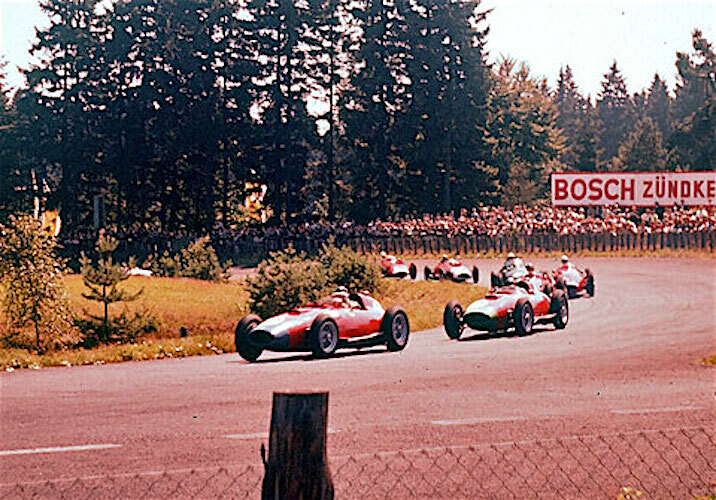 On the twelfth of twenty-two laps Fangio pitted with a twenty-eight second lead. Collins took the lead followed by teammate Hawthorn. During the pit stop Fangio got out of the car to get a new set of goggles. The mechanics made a mess of the pit stop. There was difficulty changing the rear tires and the stop took over fifty-six seconds. At first Fangio made no impression against the Ferraris, the Ferrari pit signaled ‘steady’ at the end of lap fourteen. 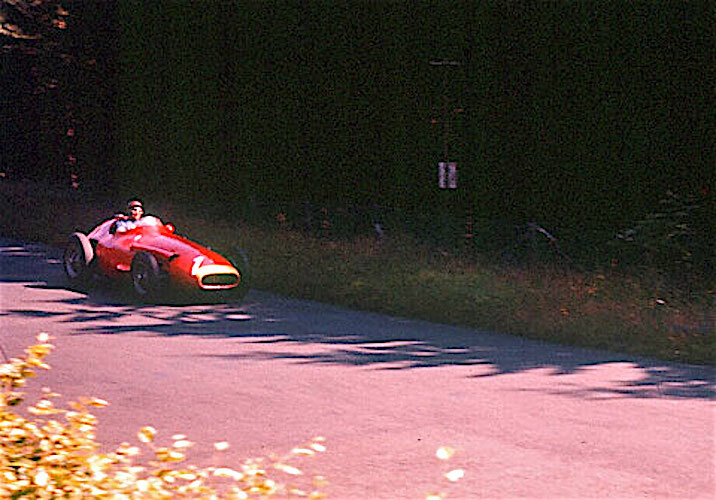 Bertocchi in the Maserati pit signaled ‘flat-out’ and Fangio recovered over fourteen seconds on lap fifteen. Not understanding Maserati’s tactics, the Ferrari team was lulled into a false sense of security. 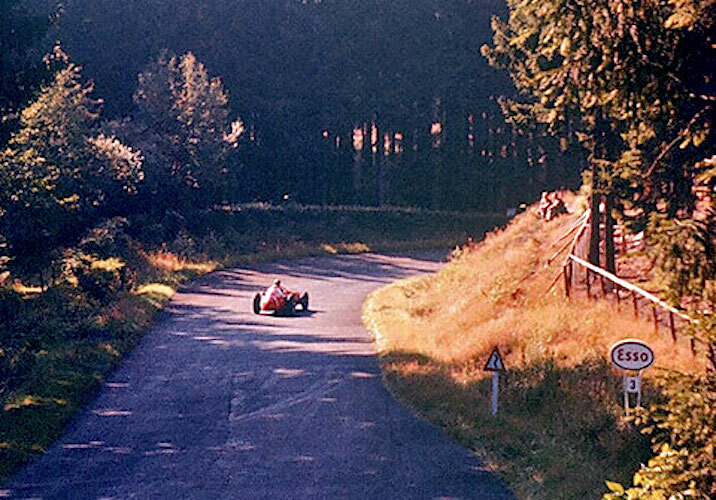 The long laps of the Nürburgring worked to Fangio’s advantage. He could make up enormous amounts of time during each of the 14.167 mile laps before the Ferrari team could inform its drivers. The Ferrari team finally woke up, and urged their drivers, but Fangio had gained the psychological advantage. 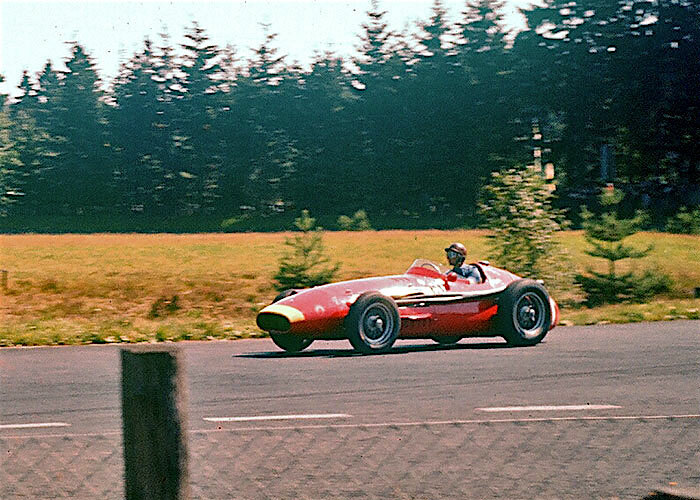 On the eighteenth lap Fangio completed the first 90 mph lap of the Nürburgring. He would break the lap record ten times. His fastest lap was 9min 17.4 seconds which was 8.2 seconds quicker than his pole time. 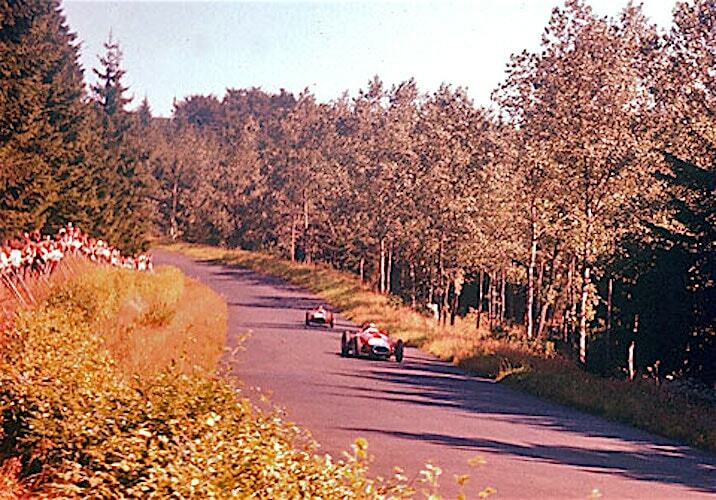 On the twenty-first lap Fangio passed Collins in the Nordkurve he then caught and passed Hawthron at Breidscheid for the race lead. The young British driver attempted to fight back. He started the final lap three seconds behind Fangio, but would drop another second by the end of the lap. When he finished the veins were standing out on his head, he was panting with fatigue, but he had shown them why he was Fangio (Henry Manney – June 1972 Road & Track – Oh, The Great Drivers). No one knew it at the time, but Fangio had won his last Grand Prix victory. He would finish in second place at the Italian and Pescara Grand Prix and be crowned World Driver Champion for the fifth time. The following is an excerpt from an Adam Cooper interviewed with Fangio in 1989. The photographs were taken by American Dean Adams. He used a ANSCO Regent 35mm camera and primarily shot Kodachrome film. The slides along with the race programs were passed onto the National Automobile Museum (The Harrah Collection) Reno, Nevada.